Warning: Some type of tick preventatives for dogs are potentially lethal when applied to cats. Always seek veterinary advice about the best tick preventatives for your pets. If you notice a tick on a pet that is not displaying signs of tick paralysis, remove the tick straight away.To do this, grasp the tick firmly where it attaches to your pet’s skin and give a quick sideways pull. It is better not to try and kill the tick first as the dying tick may inject more of its potent toxin into your pet. If you are not confident removing the tick please call us immediately to make an appointment to have it removed. Once the tick is removed your pet should be kept cool and quiet whilst being closely monitored for 24 hours. 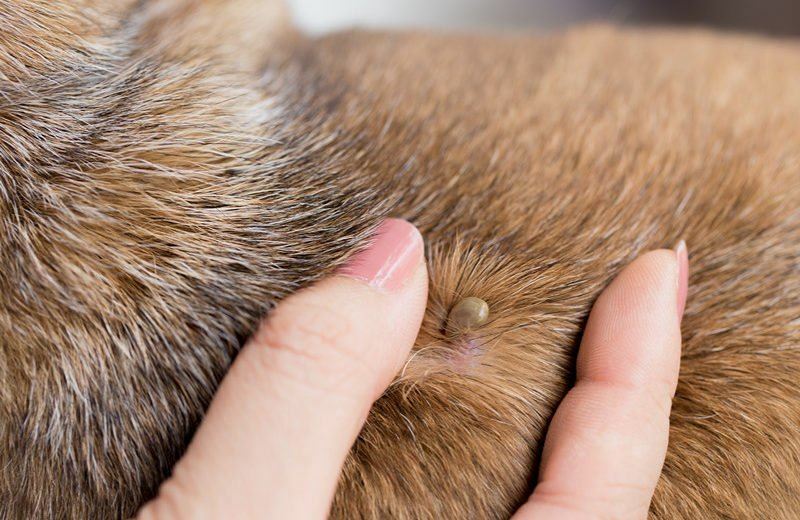 If your pet starts to display any signs of tick paralysis, such as vomiting, weakness, staggering, breathing difficulty, or altered bark, seek immediate veterinary attention as this is a genuine veterinary emergency. Do not offer food or water as these may cause aspiration in tick-affected pets. Tick preventions, such as NexGard, Bravecto Frontline Plus and Scalibor 3 Month Collar are available for use in dogs and should be used according to their label to prevent ticks. Bravecto spot on cat is the registered for tick prevention in cats. Find out more about them on our Flea control page.